Zoom out and see the big picture. After 27 years of Lean, we have mostly Fake Lean. Our collective efforts have been a failure by any measure, including the seemingly favorable measure that “every major corporation has got a Lean program.” There remains a large gap between the intended outcome and the actual outcome that must be closed. I have long said that it is unethical and misleading to cheerlead Lean successes and ignore or downplay Lean failures. I understand why people do this – to maintain interest in Lean (and to satisfy self-interest) – but that weakens, rather than strengthens, credibility. Misleading people does not respect people. It does not clearly inform them of the many and varied significant personal and organizational challenges they must undertake. Leaders are driven to make uninformed decision (the con) in the hope that they will change how they lead and make other necessary adjustments once they finally realize worthwhile the journey they are on. The vast majority never do. Knowledge is advanced by critical thinking (asking questions) followed by problem-solving via the Scientific Method. The Lean community knows this well, but is inconsistent in that it knows what to do but often does not actually do it. Instead, abnormal conditions are ignored and positive feedback soothes the mind while hiding reality. Why are we inconsistent in the use of the Scientific Method when it comes to promoting Lean? Why are there so many definitions of Lean? Why is Fake Lean so common? Why did we focus on Lean tools instead of developing people? Why didn’t we listen to the people who knew better, that Lean was not a bunch of tools? Why did we let value stream maps, A3 reports, gemba walks, and QC circles replace kaizen? Why does material and information still not flow? Why does management remain the greatest obstacle? 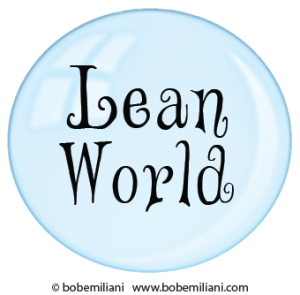 Why did it take so long to recognize Lean as a management system? Why is there confusion about the eighth waste? Why did the critically important “Respect for People” principle go unnoticed for so long? Why did it take so long to realize the nature and importance of Lean leadership? Why is it that improved behaviors are still seen as the only countermeasure for bad leadership? Why were we so quiet when people got laid off as a result of Lean? Why did we not understand that Lean must do no harm? Why do changes in managers or owners so disrupt Lean practice? Why don’t we formally analyze Lean failures and learn from that? Why isn’t Lean management widely taught in business schools? History tells us these are the conversations and analyses that must take place. Lean conferences should address these tough questions in the same manner that scientific conferences address tough questions, instead of simply showcasing success stories. Each question could be a conference track with presenters discussing their detailed analyses of these questions for review, commentary, and critique by attendees, and resulting in ideas for practical countermeasures or process improvement. This approach has a much better chance of transforming Lean from a niche management practice into a common management practice. It is a brilliant opportunity to learn, improve, and respect humanity. Great questions pointing at dispiritingly enduring problems, but I wonder: whose problems are these or, which of these problems are ours? If some seem like others’ problems, what role – if any at all – do we have in finding valid countermeasures for those? If others have/see no problems for which True Lean has countermeasures then that’s that, pretty much. Until they do, of course. For the past several decades McKinsey has been combing its substantial database of corporate performance to assess volatility in market leadership. Computing something they call the “topple rate” – roughly, the probability that a firm currently in the upper strata of a market won’t be there in five years – they observe that it’s increasing across industries and the globe i.e., that we’ll have fewer long-lived firms in the future if the trend continues. If, indeed, True Lean represents a superior form of industrial organization (I have faith in this), then a greater topple rate may hasten its ascendancy, albeit in industrial organization that may look quite foreign: different constellations of aggregation, differing market segmentations, differing value propositions, etc. Maybe one of our problems is that we are impatient. Transitions in the nature of production look rapid and crisp when viewed in the rear view mirror but are messy and take frickin’ forever as experienced in personal history. As proponents of Lean management, I think these are our shared problems. I suspect high topple rates will be attributed to factors other than bad management practice or bad leadership practice. The effect, toppling, will be attributed to external causes. This conveniently helps avoid reality, but at the same time avoids improvement. I don’t think impatience is it. The mistakes made 100 years ago by the Scientific Management advocates are being repeated today (almost exactly) by Lean advocates. We did not learn from history, and so we pay a severe price for that.